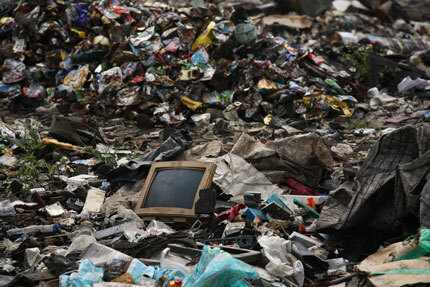 The general flow of e-waste in Nigeria starts with the importers who in most cases double as brokers. They work closely with the Lagos sea port authorities. The importers operate under the umbrella of Computer and Allied Product Dealer Association of Nigeria (CAPDAN) a regulatory body in charge of coordinating affairs in the IT industry. Importers purchase containers by its weight and not by the value of what is inside them. Medium/high quality gadgets are taken for repair/refurbishing and then are sold, usually, in the Ikeja Computer village or Alaba International market. Those considered scraps or junk are taken to different land-fills spread around the city   . The Lagos state Waste Management Authority (LAWMA) delivers the collected waste to three official dumpsites in Lagos Olusosun dumpsite, Igodun and Ikorodu. In there, several thousands of non-registered individuals, including children, widely referred to as “scavengers”, work to collect and recycle e-waste. In few cases, waste picker communities or waste scavengers living on or next to the dump sites sort valuable e-waste and sell the recovered metals such as steel, aluminum and copper dealing directly with end-processing units (such as industries who re-melt and refineries). However, the common practice among recyclers is to sell extracted materials to middle-men who take them to end processing units. Many recyclers are also active in the collection of other kind of waste.   . The e-waste sector impacts positively economically on the nearby communities and e-waste still proves to be a favorable alternative source of income. The number of jobs provided by the e-waste sector both formal and informal is substantial considering the level of unemployment. The availability of a market such as national consumption as well as export to neighboring countries for the refurbished electronic devices and the extracted materials from informal recycling ensures that this trade will continue  . Besides the obvious resources employed in the manufacturing process of electronic devices, improper and indiscriminate disposing and recycling of e-waste has some serious health, environmental and legal implications . The most affected communities are those in the environ of the Alaba International market, Ikeja Computer Village, Odo iya Alaro and Olushosun dump sites with area of influence of pollution spreading to the Ojota, Ikeja and Alaba axis. On the one hand, unusable e–waste is carelessly dumped around these communities and occasionally burnt to reduce growing piles or to the recovery of copper. The burning activities release highly toxic fumes and the dismantling and breaking operations contaminate with heavy metals the soil and nearby water bodies used for domestic purposes and farmlands. On the other hand, the high concentration of electronic waste in a location could generate “accumulated radiation”. Consequently, the sector poses serious health and environmental risk for both the workers and the immediate and neighbouring communities. These toxic metals could lead to health problems such as blood poisoning, breakdown of central nervous system, rising cases of cancer, kidney problems as well as vital organ failures, especially in children. The pickers are often unaware of the dangers they face but are economically tied to continuing the occupation   . Project Details In Nigeria an estimated 500 containers carrying about 500,000 second-hand computer and related electronic equipment enter the country each month. It is estimated that 45% comes from the U.S and another 45% from the EU. About 75% of these devices is obsolete and unserviceable, so it is collected in to three official dumpsites in Lagos: Olusosun dumpsite, Igodun Dumpsite and Ikorodu. The dumpsites ages range between 12 - 25 years and they have a combined capacity of 63.67 hectares. In the decade 1997 – 2007 the estimated tonnes of waste deposited in the 3 landfill sites were about 27 Mio tonnes . The Olusosun is the biggest of the existing three landfills in Lagos State, covering 41.7 hectares and receiving 40 per cent of the wastes being generated in the state. The Olusosun site receives 11,000 metric tonnes of wastes, delivered by 300 trucks everyday. The site had received 40 million metric tonnes since November, 1992 when it was established . Working registered population at the dump sites at Olusosun, Odo iya alaro, Alaba rago is between 600- 4000 . Obsolete computers are literally regarded as a ‘gold mine’: a metric ton of electronic scrap from used computers contains more gold than can be extracted from a 17 ton gold ore . Medium/high quality gadgets taken for repair/refurbishing are then sold in the huge Ikeja Computer village. This huge market has a size of about 1.1 km, is no longer completely residential but occupies well over 3,000 businesses in new computers, mobile phones, printers and communication equipment. The market serves as an outlet for Lagos and Nigeria as well as the neighboring West African countries. As the market is unplanned, it has experienced growing pains. Some local residents are upset at the expanding market. Traffic around the area has become very congested, and it can be almost impossible to find a place to park. The electrical infrastructure, already overloaded and unreliable, has become highly stressed with the new market. Computer and electronics stores require power to work on computers and demonstrate their products to potential customers, and this added load has made the supply erratic .